All in one check for grammar, spelling, etc. Before turning in essays to instructors, a final grammar check and spell check will ensure that essays are well-written and in the best possible condition to be graded. WriteCheck has partnered with leading education assessment organization, ETS, to provide students with the best technology for checking grammar and other writing traits. Once an essay is uploaded to WriteCheck, text is checked for grammar, spelling, usage and mechanics. 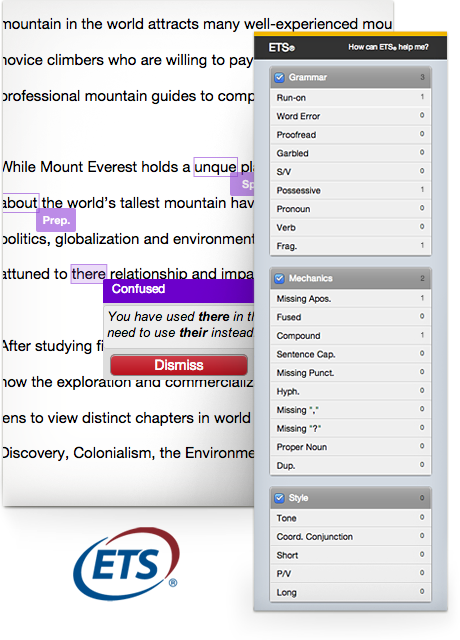 The e-rater engine identifies writing errors and helps students learn how to improve their writing skills. Within seconds of uploading a paper, a user-friendly view of results is created, including explanations of possible errors and feedback for how to improve sentences or phrases. Instantly identify any writing that needs to be corrected. WriteCheck preserves papers in their original form so that changes can be made quickly. Check papers for errors with the best grammar checker tool available. Trust the leaders – Use the same writing evaluation technology used to score the GRE and TOEFL student tests. Nearly one million students have signed up with WriteCheck to check their papers, and 9 out of 10 customers are happy with the results.